When DC’s Rebirth was first announced, I was pretty hard on it. I didn’t appreciate the language surrounding the relaunch of DC’s titles and history—specifically that it would appeal to “core” fans rather than casual readers, at a time when comics needs to bring in new readers in order to be viable? It didn’t seem like a great business idea, and I was fearful of what appealing to core fans meant. Did this mean they’d undo any push towards diversifying their talent and superhero lineup? I read the first issue of DC Universe: Rebirth when it released, but otherwise I pretty much left the relaunch alone. I kept an eye on the books that were coming out and who was writing them. I read issues here and there as they piqued my interest. And what I’ve discovered is that I’m pleasantly surprised by what’s come out of DC Comics recently. Some of the titles I’m interested in. Some I’m not. And you know what? That’s okay. Not every title has to appeal to every person. DC has done an excellent job making it clear what titles are in my wheelhouse (Wonder Woman, Batgirl, Supergirl, Batwoman, New Superman, just to name a few). That might sound simple, but line-wide relaunches are hard. When you’re launching 30, 40, 50 books at once, it’s hard to make it clear what books should appeal to which audiences. DC’s done well indicating that for the most part with carefully chosen creative teams and strong first issues. 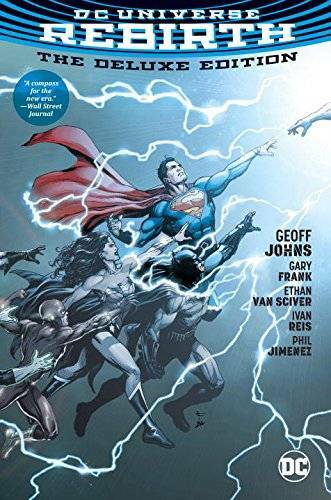 On November 29, DC released a deluxe edition of the DC Universe: Rebirth hardcover by Geoff Johns, Gary Frank, Ethan van Sciver, Ivan Reis, and Phil Jimenez, and with its release, I decided that it’s finally time. It’s time to dive into this universe, to see what it holds for me. See, to call Rebirth a universe-wide reboot isn’t actually accurate: Instead, it’s an event that restores DC universe history before their controversial 2011 reboot (called The New 52) wiped the slate clean. I was a comics reader brought in by The New 52. That is the only DC universe history I know. How, then, would I react to being dropped into a universe in which I know nothing? DC Universe: Rebirth functions as a bridge between the universe I know, The New 52, and the one that emerged out of an event called Crisis on Infinite Earths. (If you aren’t familiar with how comics events work, we explain it here. Basically, this is a four-issue miniseries that sets up the new DC Universe. If you read it and enjoy it, continue on with whatever characters’ storylines you’re interested in by reading their individual series.) It focuses on a character called Wally West, who was once The Flash, lost in spacetime and trying to connect with someone back on Earth. Wally carries an urgent message: He’s the only one who knows that time has been erased, that his friends back on Earth have forgotten key pieces of their history, that time has somehow been stolen from them. I don’t know the character of Wally West, but I was immediately hooked on his story. Despite having no previous connection with the character, I was rooting for him to succeed. The only real frustration I was left with after reading Rebirth is knowing that the mystery will take time to unfold, and the answer won’t come easily. You’re left with a lot of unanswered questions, and like any event comic, the answer will unfold slowly and over multiple series, many of which I probably won’t read. But that’s the nature of superhero shared-universe comics, and it’s up to you to judge whether that’s a price worth paying for these stories. I know I missed a lot of references in DC Universe: Rebirth. I know there’s some stuff I just didn’t get. But it didn’t matter. I understand the setup of this universe, even if I don’t quite get the details. What I appreciated about this volume is that it made clear that I don’t really need to understand them. What it said to me is that even if I don’t have long histories with the characters, I can come for the storytelling. I can take time to build those relationships as I explore the different series of Rebirth.